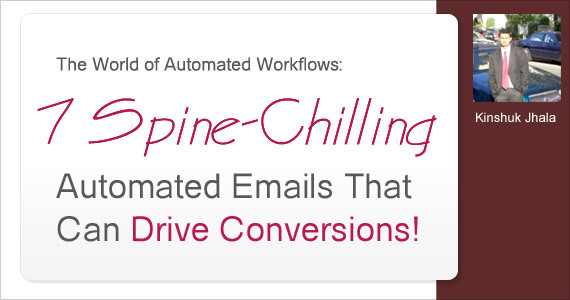 The World of Automated Workflows: 7 Spine-Chilling Automated Emails That Can Drive Conversions! Catch your customers NOW! You just have 7 emails to do so! Consumers are gung-ho about the virtual world. With this, the focus of marketers has drastically shifted to triggered and event-driven email interactions eyeing personalized and relevant cross-channel touch-points with consumers, based on a single customer view and behavioral data. One of the 2012 email marketing benchmark reports states that automated emails generate about 10.4% higher click-through. 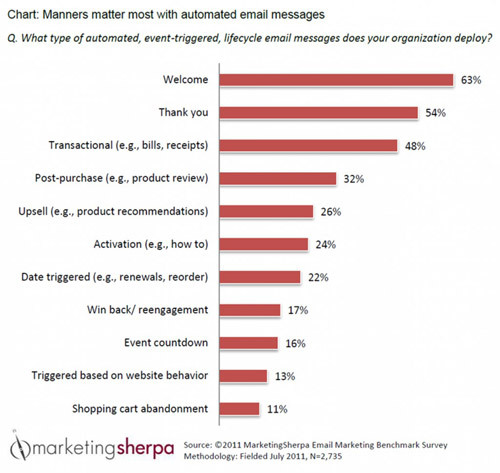 Businesses have seen conversion rates of 50% and above using automated emails. On completion of an action, there is an immediate triggered email that hits the target’s inbox. Such emails attract a lot of responses, given the timing and relevance of the email. If you wish to engage more of your audience through automated emails, go ahead today. Choose the best email from the below list and hit the ground running. Welcome or Introduction Email: One of the wonderful techniques that has attracted a lot of subscribers over time is a welcome or introduction email briefing about the organization, product or services. Welcome email extends virtual warmth to the prospect or visitor. Welcome email can trigger during an event registration, website visit, software download, form filling, email subscription activation etc. Cross-Sell or Up-Sell Emails: Conceive of a scenario when the buyer has finished a recent purchase, registration or subscription and has enjoyed associating with you. At such point in time, he may like to recommend your services to others in his network or even like to buy more of it. Cross-selling or up-selling emails are normally the automated emails that offer a related item or service at the same price or higher depending on the kind of sale. Followup emails stir up and revitalize the consumer’s decision making thought process leading to a repeat purchase, repeat open, and word-of-mouth increasing the subscription and in turn helping list building. Generally the followup emails also offer discount coupons as an effort to increase customer acquisition. Lead Nurturing Emails: Lead nurturing is an eventual process. Typical lead nurturing emails are triggered by any of the above mentioned actions and by submitting a form, putting items in an online shopping cart or expressing interest in what you’re selling through any other ways. Messages are fragmented into different time periods and are sent eventually with an objective of nurturing or educating the lead till the final close. Customer Satisfaction Emails: Feedback is mission-critical to increase customer loyalty. Customer satisfaction emails are followup emails that normally follow within a few days of a business deal (that may be buying of a product or service, online or otherwise). Reviewing the results to such responses, marketers can revamp their products, services and after-sales delivery, leading to better satisfaction. Customers are delighted when they are a part of your brand’s decision making. Cart Abandonment Emails: I want to buy flowers online. I visit the marketplace virtually and add some flowers I like to my online shopping cart; however, I do not intent to buy them now. Soon after this action, I get an email with options to complete the purchase. Such an automated email is known as cart abandonment email, inviting people to return to the abandoned cart and finish the purchase. If the customers do not turn up for a long period, they are also offered deals to finish the buy. Re-Engagement Emails: Every business has inactive leads and there are times when the Zombies get up and search for you. Engaging them is important. Have a workflow in place to re-engage with them through automated email. Upcoming Purchase Emails: In case you have contacts that buy at a regular point of time and skip the purchasing cycle at times, schedule an email for them. Remind them in advance of the upcoming purchase. Make sure the order is placed well in time. This is normally prevalent in supply chain industries. Takeaway: An automated email marketing programme will help marketers gain on their competitors easily. Set up some automated rules to track behavior of the users on your website. The relevancy and timeliness of such automated emails has produced a gargantuan success for many brands.